Was this one really a surprise? No. I was amused with the format of the judging this time, mostly at how much the judge appeared to loathe Harry, Revised. It's nice to see that I'm not the only one who sometimes has over-the-top, visceral, negative reactions to books! 😉 To share in my amusement, go here. With City of Refuge passed through to the semi-finals, I'll be intensely interested in seeing how it does against 2666. I think that it is the one book that might have a shot at taking down the Bolañosaurus (™ ToB commentator, Kevin Guilfoile). On Monday: Shadow Country vs. The Lazarus Project. Crap. I still have no idea how to call either of these two books in separate matches, never mind up against one another. I'm gonna go with The Lazarus Project, just because. Yessssssss! I have never been happier to be wrong about my prediction regarding this match-up. Judge Newton did the right thing and ousted the execrable A Partisan's Daughter and I am jumping for joy! No tantrums! Huzzah! That being said, the more I read about 2666, the less enthusiastic I am about eventually reading it. In light of it winning this match-up, one of the commentators went back and revisited 2666 in an attempt to see if he could improve his impression of it. He couldn't, and his description of the content (such as it is) sounds both mind-bogglingly dull as well as distasteful. I have a copy of the book so I will of course give it a try, but I'll be dragging my feet! 😉 To read more, see here. Tomorrow: Round 2 continues with Harry, Revised duking it out with City of Refuge. I feel pretty confident calling this one in favor of City of Refuge. Check back tomorrow to see if I am proven wrong! Drat! I knew I should have gone with my intuition that My Revolutions would be just the kind of book a ToB judge would enjoy and put through to the next round! See how the match went down here. On some level, this first round of the ToB has been filled with upsets, as many of the top-seed books (and more widely recognized books) have been unseated by lower-tiered books, BUT I think that when you look at the judges for most of the rounds, the decisions haven't been all that surprising, not really. What I found interesting in today's commentary was that many of the commentators' top books in the tourney have already been ousted... and the general sense I've been getting from those following the tournament is that "upset" really is the best term for the outcomes of many of these matches. I take the ToB all in good fun, but I also do look to it for inspiration when it comes to my reading, and so I wonder whether the fact that the judges seem to be largely making unpopular choices (you can check this out by voting at the end of each match as to whether you agree with the outcome or not) is at all detrimental. Yes, it keeps things interesting, but if the majority of readers think the book that's going through to round 2 is crap, then how much weight should I allot the outcome of these matches in swaying my reaing habits? Ah well, I suppose part of the charm of this competition is that it is unabashedly a biased one! Tomorrow brings us the first match up of Round 2: 2666 faces off against A Partisan's Daughter. Maud Newton is judging, and I know nothing about her, but I am telling you if APD makes it past this round, I will think less of her (and I don't simply mean that I will not spend as much time thinking about Ms. Newton). I have a sinking suspicion she might pick APD for the win (that's what I'm predicting, much as it pains me to do so), but I really hope that's not the case. I won't lie: I might throw a tantrum if APD makes it through to Round 3. Another round that I called correctly, though the judge had me sweating for a bit what with the large heapings of love he sent The Dart-League King's way. I don't know why I feel this way, but I get the sense that if the judge had been a woman, the contest between these two books might not have been nearly as close. TDLK just sounds so much like a guy's book to me... I get that both commentators dug TDLK quite a lot, but the snippets I gleaned about the book throughout the match did not make me very interested in reading it (drugged up dart playing in Idaho is not so much my thing, funny or not). It's a non-issue for me in the end though, as it's not even on order at my public library, and despite ToB's best efforts, I'm not going to run out and buy myself a copy. 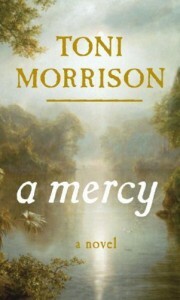 I haven't read A Mercy, but I did read my first Morrison earlier this year and was suitably impressed by it, so I do intend to eventually check this one out when I can get a hold of a library copy. I think I'm glad about this outcome. Read the full report here. Next Up: The final match-up in Round 1 sees Home go up against My Revolutions. My Revolutions has the veneer of edginess that I think tends to fare well for books in this tournament, but Home was written by Marilynne Robinson, and it seems every literary person on the planet loves Marilynne Robinson (I, on the other hand, have a copy of Gilead that I've not yet read, so I cannot speak to her awesomeness). I know nothing about the judge and his reading proclivities, so this match is crazy hard to predict. I didn't read either of these books, but Tony wasn't all that impressed with My Revolutions, so I think I'll call it in favor of Home (but I won't be surprised if it goes to My Revolutions). Curses! The very rationale I used for justifying Ali choosing The Northern Clemency actually worked against me this round! D'oh! It sounds like Ali enjoyed both books this round, although one thing I've been noticing this year is that the commentators tend to prefer the book the judge didn't pick in many cases. I found the discussion on The Lazarus Project intriguing (especially the comparison to Jonathan Safran Foer), so I will probably check it out in the future. I am torn about The Northern Clemency - I did take it out from the library and started reading it, and made it about 200 pages in (I read the first section of the book), and I just wasn't gripped by it. This was during my frantic reading phase so I might not have been in the right mindset for a longer book, but I do feel like it might be a book I should try again at some nebulous future time. What I read was not bad by any means, but I did find the numerous secondary and tertiary characters (who are followed in quite a bit of depth) to be overwhelming and distracting from any kind of central narrative. Next up: A Mercy goes head to head with The Dart League King. My library doesn't even have a copy of the latter, and I'm at a loss as to predict how this will go. In any other tournament I'd feel like one could pretty safely back A Mercy, but with the Tournament of Books, is there ever a sure fire choice? Still, I'm going to go with what makes sense to me and pick A Mercy. Here was a match-up I really had a hard time laying down a prediction for, but it also counts as one that I accurately called. My premonition that the superficially light-weight vibe of Frankie would work against it turned out to be true. To be fair, I didn't think Frankie was as nearly flawless/amazing/insightful as the commentators' raves would have you believe, but it wasn't a bad way to spend a Sunday afternoon, and was likely a very good example of what YA literature can achieve (I am hypothesizing here, because I don't really read YA literature, and so if YA literature tends to be more on the Twilight end of things, then Frankie definitely deserves all the accolades it is receiving, and yes, one certainly could do worse than it!). But I don't think the judge could get over it being YA, and to be honest, as true as many moments rang throughout the course of it, to me Frankie didn't transcend that boundary either. I agree that comparing Frankie to Shadow Country is akin to the old "apples and oranges", but them's the breaks and while it might have prevailed against a title like Harry, Revised that's not how the cards were dealt. For more details, go here. People who love Frankie are very vocal about it, so it's entirely possible that it might come back in the zombie round... For what it's worth, it's probably the book I have enjoyed most out of the ToB contenders that I've read thus far. Based on what I read, I'm not sure if Shadow Country is really something I'm interested in reading - the topic sounds reasonably interesting, but why so long? (Ok, I know it's so long because it was really three books that merged into 1, but still!) It sounds like it's more fun to read than 2666, but it may be six of one, a dozen of the other, if you see what I'm saying. On Monday: The Lazarus Project vs. The Northern Clemency. The former, I know nothing about, and the latter has been likened to a British version of The Corrections. I find this one hard to call, but I think I'll give it to The Northern Clemency. Monica Ali is British, right? That makes sense and is enough of a reason to suspect she'll vote for it, no? I suppose this round’s outcome counts as yet another upset in the sense that a top seed was unseated by a lower-seeded book, but I am anything but upset! I was so glad to read that the judge, Mary Roach, agreed with my sentiments of the ultimate boredom & repetitiveness factor regarding Unaccustomed Earth. Do I think Lahiri is a talented writer? Definitely. But do I think she would have been better served (or perhaps to be more accurate, I would have been better served) by just writing a novel rather than a short story collection here? Yes. Next up is Shadow Country against The Disreputable History of Frankie Landau-Banks. I’m not sure at all how this will go, because all I know about Shadow Country is that it is a behemoth of 2666 proportions (read: 900+ pages). I think this one will come down to what the judge has a tolerance for. It’s hard to see how a quick reading YA novel will fare against something of sterner stuff, but the real issues is whether those 900+ pages are any good… I think I'm going to pick Shadow Country for the victor here, but really your guess is as good as mine! And another upset befalls the tournament! Only this one, I was expecting. To me, Harry, Revised seems exactly the kind of book that judges at The Morning News would enjoy. I still plan to read The White Tiger, as I've already got it out from the library, and it seems as though the book was still enjoyable to the judge. For the full report, go here. Next up: Unaccustomed Earth vs. City of Refuge. I am hoping that City knocks this one out - so far the top seeds haven't been faring too well, so it's always possible. Hopefully the judge finds Unaccustomed Earth as tedious as many of us did!